We offer full kitchen remodeling services from the planning stages through to the completion of a kitchen renovation or remodel project. Our professional and competent staff will guide you through each step of the kitchen remodeling process to make sure the final design is something you can enjoy and be proud of for years to come. As a full-service professional remodeling company, we have the experience and capabilities to handle a home or commercial remodel of virtually any size or scope. Whether it’s an interior or an exterior kitchen remodel, we are the Tulsa kitchen contractor you’ve been looking for and we are ready to get started on your next big project! As one of Tulsa’s leading remodel contractors, we also serve the surrounding areas, like Bixby, Broken Arrow, Sand Springs, Owasso, and Jenks. You spend a great deal of time in the kitchen, so having that room look fantastic and provide outstanding functionality is worth every penny you spend. As a bonus, a kitchen remodel in Tulsa will provide and excellent return on your investment should you ever need to sell. When it comes to projects that will raise your home’s value, a kitchen renovation is always at the top of the list. The fact of the matter is: Kitchens sell houses! According to real estate experts, kitchens are one of the first rooms that a buyer will look at when they want to purchase a home. Most home buyers are looking for modern conveniences as well as current styles, especially in newer homes, where such features are expected. Even smaller kitchen renovations, like resurfacing kitchen cabinets, changing hardware and making other minor improvements, can boost a home’s value enough that the upgrades come close to paying for themselves. According to a Cost vs. Value report from Remodeling Magazine, small kitchen projects earn a return on investment of more than 83%. Just keep in mind that kitchen remodeling should always be done by a professional to make sure that the upgrade is up to standard and that the efforts will definitely increase the resale value of the home. Before you even start calculating your return, you need to take a realistic look at your budget. Discuss what you’re willing to spend with your designer before you start to plan. Many consider this phase to be the ‘fun’ part of the remodeling process. From cabinets to the finishing features and everything in between, all the pieces must be chosen and all the parts must fit together cohesively before the project can begin. Our role in this phase is to translate your needs and desires into creative, functional, and aesthetically pleasing design possibilities. 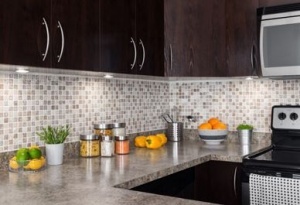 To complement your cabinets, you may choose countertops made from laminate, solid surface countertops (such as corian countertops or acrylic countertops), tile, or granite in an array of beautiful colors and textures. Consider inviting Wilsonart® laminates into your home with the very best in looks and enduring wear. They offer a wide range of exquisite laminates that are exceptional not only for their tasteful good looks and warm, lifelike appearance, but also for their reasonable prices. Lastly, backsplashes can match these surfaces or you may choose a completely different product. We can use all types of flooring from wood to ceramic tile and everything in between. Wood flooring both pre-finished and unfinished are available in any type. Ceramic tile comes in many different colors, textures and compositions for you to choose from. Once you have the cabinets, countertops, and flooring picked out, it’s time to decide on paint colors or wallpapers and fixtures that will balance the overall look of your kitchen. Also available are features to customize your new kitchen such as under cabinet lighting, over cabinet indirect lighting, pull out recycling bins and trash containers, drawers with special inserts for specialty tools, pull out drawers for cooking utensils, and much more. Don’t freak out! 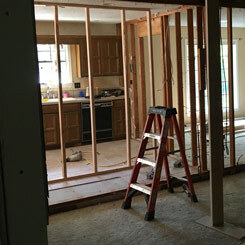 When done correctly, the demolition phase doesn’t have to be a nightmare with the destruction of your kitchen. However, be prepared for everything that was once in your kitchen to be removed and to end up with an empty room only discernable by the studs that remain. This means that you will likely not be able to use your kitchen to prepare meals while the work is being done. Be sure to plan within your budget the extra cost of eating out for the duration of the project. To prepare your kitchen workspace for deconstruction, first the furniture and everything inside the cabinets or on top of countertops has to be removed. It’s also a good idea to remove any pictures that might be hanging from adjacent walls to the kitchen and to cover any furniture or items that are in adjacent rooms with drop clothes before the demolition begins. Sometimes renovations, especially major ones that reconfigure a room, require that existing electrical wiring or plumbing be moved so that new fixtures can be installed in the correct place and to code. TIMCO is one of Tulsa’s leading drywall contractors! We work hard to get the job done correctly, neatly, and in a timely manner. The drywall phase of kitchen construction shows progress rather quickly. Once the drywall is hung and the studs are covered back up, the room again takes on its shape. The walls and ceiling are then painted before the next phase begins. The painting process goes fairly quickly when dealing with an empty room. Kitchen cabinets are the centerpiece of how you and others experience your new kitchen. 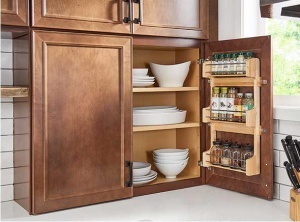 Waypoint® cabinetry is built to last and steps are taken throughout the installation process to ensure that it does. Once the cabinet installer begins working the room starts to look more and more like the kitchen it will become. Sometimes the cabinet installation is also done in phases around the fitting of the countertops; generally with the lower cabinets completed first and then the upper cabinets completed later on. Custom built cabinets are usually stained or painted and finished out on site. Once the lower cabinets are in place, they will be measured and templates are created so that the countertop can be precut at an offsite facility. This part of the process typically takes a week or two, but while waiting for the countertops, the rest of the upper cabinets can be installed. Sometimes there may be a few days where the crew isn’t working at all while they wait on the countertops to be installed. With all the many choices available for kitchen countertops (Formica laminate, solid surface, corian, acrylic, etc.) there might be some slight variances in the process depending on which material you’ve chosen to use. Choosing the right countertops is an important part of building “The kitchen of your dreams.” Sometime projects with a shorter time limit to completion might need a faster countertop solution. For more information about how Formica laminate can save you time and money on your kitchen countertops, keep reading below. Finally the backsplash and the flooring are installed to complete the last major phase of the kitchen remodeling process. Depending on the type of flooring that was chosen, the length of time for this phase to end can vary. TIMCO installs all types of flooring from wood to ceramic tile and everything in between. Like a jack-of-all-trades, we consider ourselves Tulsa’s best tile installer, Formica laminate installer, hardwood installer, and more. We do it all! Ah the finishing touches, those last few details that really bring character to your kitchen and wrap up your renovation project with a nice little bow. During this process the crown molding is installed, the light fixtures are wired, the kitchen sink is put into place with all of its fixtures plumbed, appliances go in, and any other custom features are mounted. After all that, dust is everywhere! But no worries, TIMCO also has a great clean up crew! We are experts at efficiently and thoroughly cleaning up after major remodeling projects. By the end of this phase “The kitchen of your dreams” will be clean and ready for you to cook your first meal. Countertops are one of the first things people notice when walking into your kitchen, but you don’t have to spend a small fortune on granite to make them stand out. We offer beautiful Formica laminate countertops that will give your kitchen the look you always wanted at a fraction of the cost for stone materials. Formica countertops now come in a wide variety of sizes, patterns, colors, and finishes, so you are sure to find the perfect fit for your space. With so many options to choose from, finding a design that compliments the rest of your kitchen is no problem. 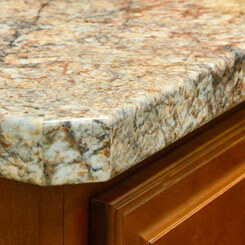 These laminate countertops are easy to clean and maintain, durable, and seamless. Furthermore, Formica countertops are incredibly affordable when compared to granite countertops, saving you thousands of dollars while you still get the look and durability of high-end kitchen countertops. 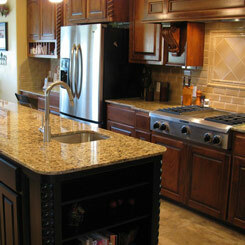 Granite and stone materials have overwhelmed the market in recent years, but laminate is quickly catching up. Formica laminate countertops have made significant changes to their design in order to keep up with the competition. The changes to laminate countertops resulted in a much larger selection of beautiful and luxurious patterns and designs, many of which perfectly mimic the look of pricey stonework. Adding Formica laminate countertops to your kitchen also increases your home’s value while making it more attractive for you and your guests. If you want the luxury and quality of stone countertops without the high-end price tag, let the professionals at TIMCO help you along every step of the way. We will work with you to choose the best countertops for your kitchen, giving your kitchen the look and functionality you have always wanted. We offer a nearly endless variety of Formica countertops and strive to turn your dream kitchen into a reality, all at an affordable price. If you can dream it, we can do it! The remodeling professionals at TIMCO make the process of installing new countertops quick and easy, and we share your passion for excellence. Our constant efforts towards providing excellent customer service have made us a leader in the installation of Formica laminate countertops in Tulsa and surrounding areas, like Bixby, Broken Arrow, Sand Springs, Owasso, and Jenks.